One of the most challenging and enduring effects of our region’s staggering population decline is vacant and neglected land. Today, there are more than 25,000 vacant lots throughout the City of Pittsburgh. 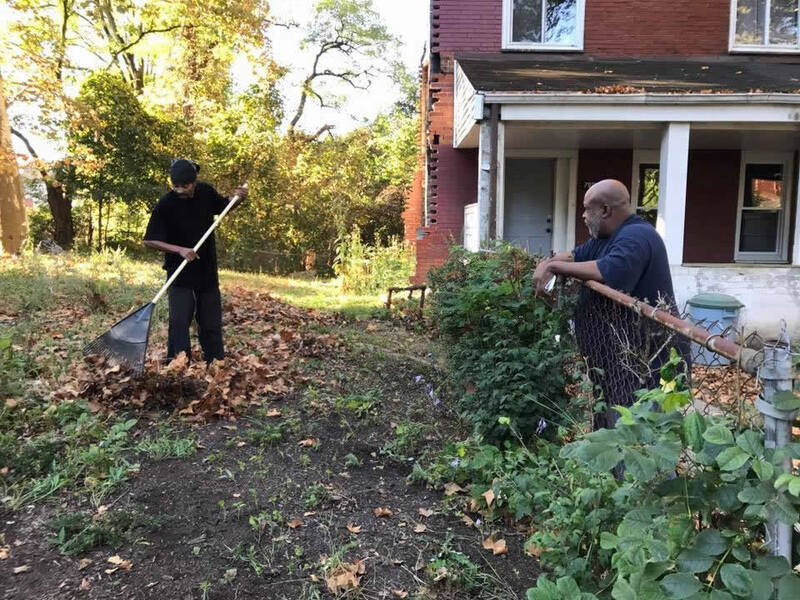 Vacant lots compromise the quality of life and health of residents by reducing property values, creating community health hazards, and decreasing the tax-base for the surrounding neighborhood. Vacant land is not only an environmental challenge, but also a social and economic one. Vacant lots are concentrated in our most vulnerable and distressed neighborhoods. This reality exacerbates challenges surrounding investment, jobs, neighborhood cohesion, and public health. Communities that suffer the effects of vacant land are the closest to and most familiar with the struggles of vacant land maintenance. CommunityCare Steward, Beverly Howell, completes a tree tending workshop in Homewood. 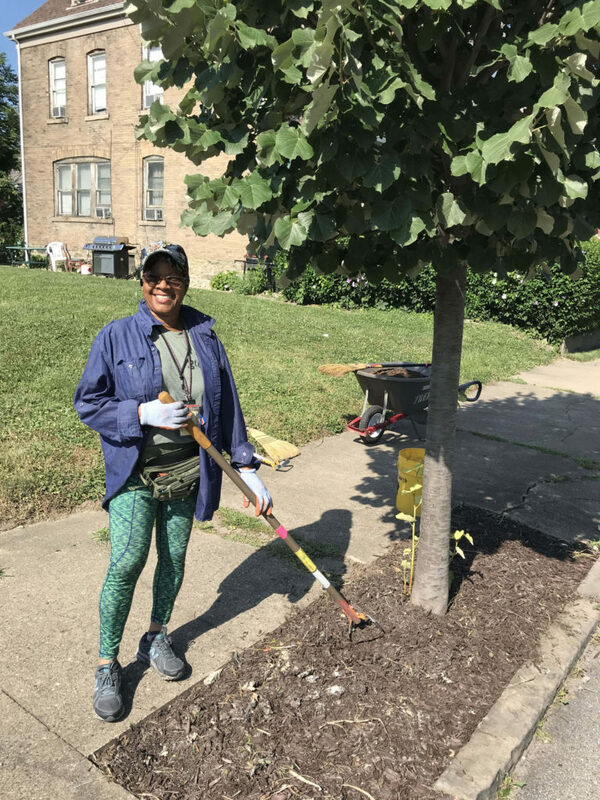 Using the skills gained in the workshop, Howell will continue to care for trees near her home, ensuring her neighbors receive the multitude of benefits gained by protecting the urban tree canopy. With support from The Benter Foundation, Grounded is working to inspire, support, and reinforce people coming together to care for vacant lots and urban greenspace. In 2017, Grounded launched the Community Pilot Program in Homewood to investigate what motivates and sustains individual participation in environmental stewardship activities. Program participants, called ‘stewards’, are provided training and tools to sustain local capacity, forms of non-monetary compensation to keep local costs low and relieve financial pressure, and opportunities to expand social and professional networks. Driving our work is the need to address a critical gap in greenspace stewardship and embedding this capacity within communities. A neighbor stops to thank a CommunityCare steward for cleaning up a vacant lot near his home. In doing so, we can achieve multiple goals with one investment that impacts the environment, social cohesion, and economic opportunity. 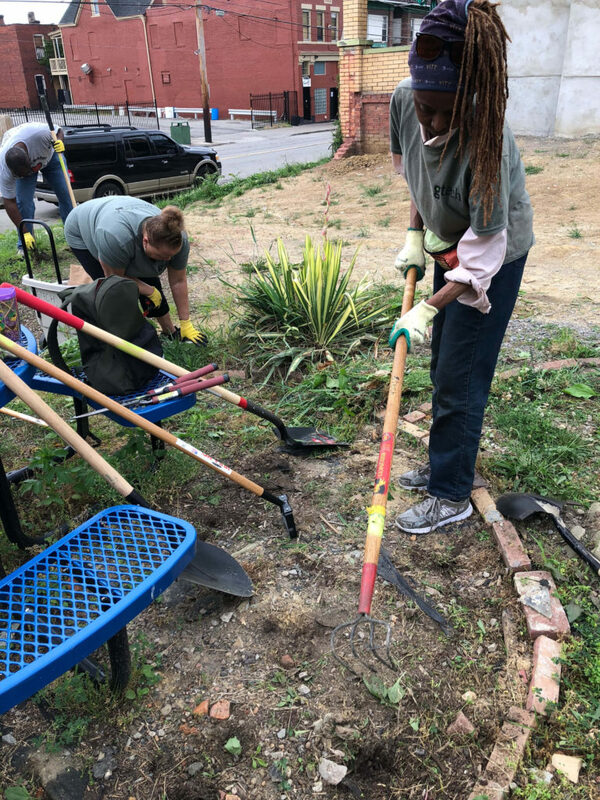 CommunityCare stewards lend a hand to a cleanup effort at a vacant lot in Homewood that provides opportunities for outdoor play and learning to local families. So far, we have found residents getting actively involved in their neighborhood, taking on their own initiatives, and coming together to resolve the root causes of vacancy and neglect. In 2018, Grounded expanded the CommunityCare Pilot Program to Larimer with an emphasis on transforming and tending to vacant lots. The Benter Foundation has allowed Grounded to develop a stewardship model that can inform large-scale improvements and make changes to investments at the local level. Anna Archer, CommunityCare Project Manager.